The report is as clear as it gets at this early stage of the investigation, news of which broke Friday. Peter Bergen is CNN's national security analyst, a vice president at New America and a professor of practice at Arizona State University. He is the author of "United States of Jihad: Investigating America's Homegrown Terrorists." Paul, he also claims Aleppo belongs to Turkey. Happy Halloween! Erdogan: Greek islands "used to be ours"
Erdogan said that the Treaty of Lausanne which set the borders between Greece and Turkey in 1923, was unfair on his country as it gave many Greek populated areas to Greece. “We have our monuments and our mosques there [on the islands],” he said. He made no reference to the innumerable amount of Greek churches on Turkish territory, including the infamous Agia Sofia in Istanbul. Meanwhile, the Shia-led Popular Mobilization Units in Iraq denounced Erdogan's statement on the Greek islands. Erdogan in recent times has also claimed that Mosul is Turkish territory. "Alabama has been dubbed America’s Amazon. It has the most navigable water channels in the country and boasts the most freshwater biodiversity. So dead and dying rivers and streams can spell disaster for ecosystems, as well as local communities living near water bodies and industries relying on these water channels for survival." The author of the following report (which includes the above chart) is trying to cover so many bases about Alabama's severe drought that the writing meanders -- although granted she's doing her best to comprehensively inform about a longstanding situation that has gotten virtually no coverage nationally and is now at crisis proportions. But while I recommend that those interested in drought/water issues read the entire report, here I'll just feature passages that specifically address the state's water management, or rather lack thereof. But first, a short lecture I've given before. 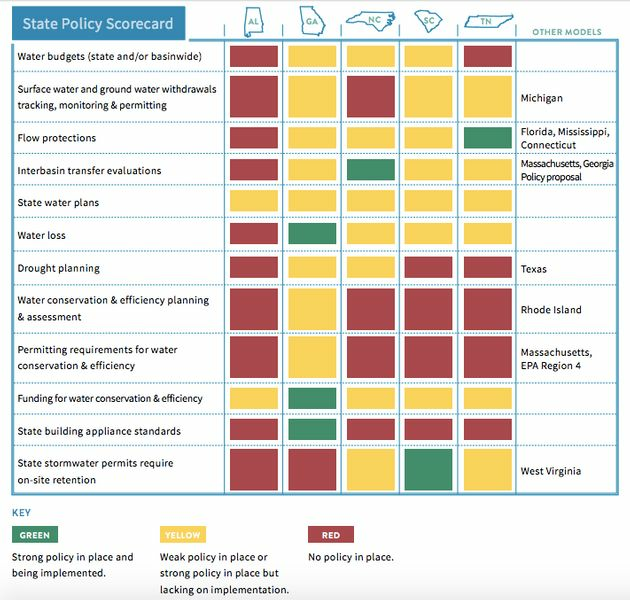 A glance at the chart shows that Alabama, while a 'worst' offender, is by no means the only southeastern U.S. state with wretched to nonexistent water policy implementation. The story the chart tells is also the story of the tug-of-war in America between federal and state control. The states want a great deal of control -- until they apply for federal disaster aid. That aid was originally conceived to address disasters that are Acts of God. But it's become a way for state residents to avoid responsibilities related to preparing for natural disasters and mitigating their worst effects. That laissez faire approach will be derailed at the worst possible time for Americans: when several states are hit by natural disaster(s) in the same period. Not to plan for this eventuality is folly; take a look at today's headlines out of Italy if you need a reminder of why. With 98 percent of the state affected, Alabama’s abysmal water management planning is under intense scrutiny. Forecasters said this week that the drought is showing no signs of abating. Alabama will likely experience not a wet, but a drier than usual winter this year, according to the National Oceanic and Atmospheric Administration. The agency said the drought is expected to persist through Jan. 31, bringing worsening conditions to areas already in the grips of a crisis. It’s anticipated that drought will consume the entire state by year’s end. [Mitch] Reid is one of many water management experts and activists who believe that a central contributing factor to Alabama’s current drought emergency is a total failure of the state’s government to manage its water. Alabama is the worst state in the Southeast in terms of water management, security and sustainability, according to a September report from the National River Network. The state doesn’t have a statewide water budget, a monitoring plan for surface and ground water withdrawals, flow protections, drought planning, or water conservation and efficiency planning, among other water policies, the NRN found. And it’s not just regionally where Alabama is failing. In 2012, The Alliance for Water Efficiency and the Environmental Law Institute’s national assessment on water efficiency and conservation gave Alabama, along with four other states, the very worst score: 2 points out of a possible 40, or a “D” grade. “There are no records of who’s using water where and when, so it’s just lots of pointing fingers. It’s like the Wild West,” he said. While streams are running dry and farmers are struggling to grow crops, some companies and individuals are still using water excessively in drought-stricken parts of the state, Reid said. Just upstream from his home and the bone-dry Patton Creek, a golf course has continued to irrigate its lawns, he said. “Without a plan, water users are not required to conserve their water, even during a drought,” Rogers said in an email this week. There are signs that the state has started to awaken to the need for an improved water management plan. In 2012, Alabama Gov. Robert Bentley (R) gave five state agencies the directive to put together a comprehensive water management plan. Nothing concrete, however, has yet emerged from this initiative. “That effort, I would hope, will produce a permit program for large water withdrawals, a system that will establish and implement environmental flows on our rivers and streams, and a more effective approach for dealing with droughts,” he said. However, an effort to create “a more rational approach, rather than the essentially laissez faire approach we have now” will only be successful if “stakeholders look to the common good of the state, as opposed to more narrow economic interests,” Aldreen warned. State legislators will also need to “have the courage and wisdom to act,” he added. Many observers say it’s still too early to tell whether Alabama’s water plans will succeed. But most agree that the time to act is now — both to address the current crisis and to mitigate future drought disasters. “Alabama cannot afford to continue this pattern of sitting idle, even as the warning signs start to emerge,” Rogers said. The governor needs to take immediate action to restrict all outside water use across the state, according to Reid. “We don’t want to see more rivers and streams turn into Patton Creek,” he said. A mighty earthquake has hit central Italy, shaking buildings as far away as Rome. Reports on the magnitude varied from 6.5 to 7.1. This comes only three days after two more tremors shook the region on Wednesday, leaving villages partly destroyed. At the moment, USGS's website puts the magnitude at 6.6. Initial reports on the magnitude of the tremors varied – while USGS and Italian media first talked of a 7.1 earthquake, the European-Mediterranean Seismological Center (EMSC) said the tremor was magnitude 6.5 or 6.6. Italy Civil Protection reports buildings collapsing in a number of locations following Sunday's tremors. They did not provide any information regarding casualties. The epicenter of the quake was located between the cities of Perugia and Macerata. The first tremor was followed by two others of magnitudes of 4.6 and 4.1. "U.S. Orders Family Members to Leave Consulate in Istanbul"
The State Department has ordered family members of employees at the U.S. Consulate General in Istanbul to leave amid fears of extremist groups targeting Americans and neighborhoods where they reside. The State Department in an advisory Saturday also warned Americans in the country to take caution, and said extremist groups have threatened to kill or kidnap U.S. citizens and Westerners. The U.S. Consulate in Istanbul remains open. The order does not apply to other U.S. diplomatic posts in the country. TEHRAN (FNA)- The ISIL is using hundreds of female terrorists from different world countries to drive suicide vehicles of their husbands during the Mosul liberation operation by Iraq's joint military forces, media reports said. "Most of ISIL's foreign terrorists and their wives have enrolled for suicide attacks," the Arabic-language media quoted a local force as saying. He reiterated that a sum of 450 ISIL terrorists and their wives who are mostly French or from the former Soviet republics have registered their names to take part in the suicide missions. "The women have been ordered to drive the bomb-laden vehicles of their husbands to help them get closer to the Iraqi troops, while their husbands spray bullets at the Iraqi forces," the source added. Earlier on Saturday, Hashd al-Shaabi started its long-waited offensive against the ISIL West of the Northern Iraqi city of Mosul. “The operation aims to cut supplies between Mosul and Raqqah (in Syria) and tighten the siege (against the ISIL) in Mosul and liberate (the town of) Tal Afar,” Ahmad al-Assadi, a spokesman for the forces said. Syria: "Jaish Al-Fatah Leader Admits Receiving Financial, Military Aid from Saudi Arabia"
TEHRAN (FNA)- Abdullah Muhammad al-Muhaysini, a senior al Qaeda-linked cleric and the religious leader of Jeish [Jaish] al-Fatah terrorist group, admitted that the militants in Syria have received financial and military aid from Saudi Arabia and certain other Persian Gulf Arab states. According to the Syrian dissidents' news website, Enab, Muhaysini has released a video recently in which he appreciated Riyadh and other Arab states for equipping his comrades with missiles. The Saudi preacher said that the missiles that they have sent would be used to break the Syrian army and its allies' siege of Aleppo. He also thanked Turkey for supporting the terrorists and treating the wounded militants in its hospitals. Jeish al-Fatah is a conglomerate of terrorist groups with Al-Nusra (Fatah Al-Sham) Front comprising its main body. In relevant remarks in June, a source said that Saudi Arabia has sent new cargoes of weapons and financial aid to the terrorists in Aleppo in Northern Syria to strengthen them against the Syrian army and its allies' fresh attacks. "The Saudi regime has recently sent small arms and new equipment, including 5 drones, to the terrorists in Syria," the source said. To this end, Riyadh has sent one of its ranking officers to the regions controlled by terrorists in Northern Aleppo to supply them with money and arms to intensify attacks and open new fronts against the Syrian army and popular forces, the source added. Also, a prominent Syrian military analyst said earlier this month that the terrorists in Aleppo take orders from outside and don’t dare to leave the city in anticipation of punishment by Saudi Arabia and Turkey. "Violation of the ceasefire by the terrorists and their opposition to the evacuation of Aleppo is of no surprise as they are not the ones in charge of the decision-making for remaining or leaving the city, rather they take orders from the regional and international sides for whom they are working," Turki Hassan told FNA last Saturday. Noting that the main cause of the terrorists' stubborn stay in Aleppo is that leaders of Fatah al-Sham (formerly known as al-Nusra) Front and Ahrar al-Sham are afraid of punishment by their Qatari, Saudi and Turkish masters, he said, "If they move in defiance of their Qatari, Saudi and Turkish lords, they might be killed and their properties be seized." The Army of Conquest ... or Jaish al-Fatah, abbreviated JaF, is a joint command center of Islamist Syrian rebel factions participating in the Syrian Civil War. The alliance was formed in March 2015 under the supervision and coordination of Saudi cleric Dr Abdullah al-Muhaysini. It consists of Islamist rebel factions mainly active in the Idlib Governorate, with some factions active in the Hama and Latakia Governorates. In the course of the following months, it seized most of Idlib province. It is actively supported by Saudi Arabia and Turkey. In an October 2015 publication, the Washington D.C.-based Institute for the Study of War considered Jaish al-Fatah as one of the "powerbrokers" in Idlib, Hama, Daraa and Quneitra provinces, though not in Damascus province, being primarily "anti-regime" and "anti-Hezbollah" but not necessarily "anti-ISIS". What is the actual Syrian civilian death toll? I've been down this road before, but finally the Russian government decided to look at the question. It turns out the figure they came up with is roughly the same as one arrived at by an Israeli intelligence agency. Both figures are far lower than the astronomical numbers bandied about by NATO, Arab Gulf governments, and the United Nations. In July 2013, UN Secretary General Ban Ki-moon said that the death toll in the Syrian conflict topped 100,000. In October 2014, UN High Commissioner for Human Rights Zeid Ra'ad Al Hussein said the death toll was 200,000. By October 2015, according to the UN, the war claimed over 240,000 lives. In September 2016, official UN estimates revealed that 300,000 people were killed in the Syrian conflict. In addition, the UN said that nearly 50 percent of the population was displaced. According to the Dubai-based TV channel Al-Arabiya, in October 2015, the death toll surpassed 250,000. The same data was earlier provided by The New York Times. After Russia launched its aerial campaign in Syria, the Syrian death toll in Western media continued to grow. Parties involved in the conflict adjust data to their own interests. In addition, the media often reports unconfirmed data from the opposition-established Syrian Observatory for Human Rights. But do all those numbers reflect the situation on the ground? The Institute for Eastern Studies of the Russian Academy of Sciences conducted its own research, using data from the Syrian Central Bureau of Statistics. The report was presented at a press conference in Moscow on October 28, 2016. In 2011, the Syrian population was 22.5 million people. According to Syrian statistics, since that time the population has decreased to 17.87 million. The research revealed that a total of 105,000 Syrians have been killed in the war, including 45,000 soldiers and militia fighters, 24,000 militants and 36,000 civilians. The majority of civilians were killed by jihadists and the so-called moderate opposition forces, according to the report. In addition, nearly 18,000 foreign terrorists recruited from over 80 countries have been killed in the war. Earlier, Yaakov Kedmi, head of the Israeli intelligence agency Nativ, unveiled nearly the same data, including about 40,000 civilians killed. Meanwhile, US estimates usually range between several hundreds of thousands to a million, which seems quite unrealistic. According to the author, the United States speculates on human lives while Washington itself has been involved in a series of "regime changes" in the Middle East and North Africa. "Restaurant industry second largest employer in the USA"
Jim mentioned the statistic about the restaurant industry almost in passing (and noted that public elementary and high schools are the largest employer) to convey why the recent large number of restaurant bankruptcies is a red flag for the U.S. He noted there are just too many restaurants. Well I don't know what to say here, beyond "Vote Trump." But how many times can you say that to people who're under the impression that other governments can keep buying Washington's debt in large enough measure to stave off an economic crash in the USA? Or maybe these cockeyed socialist optimists are hoping that the federal government will take in enough revenue from grave robbing, so to speak -- taxes on the estates of dead Baby Boomers -- that it will be able to support an out-of-work electorate. 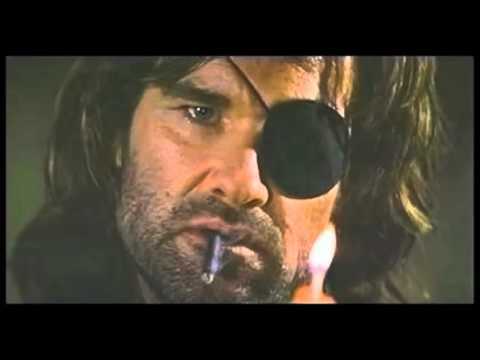 Then again, maybe socialists actually want a huge economic crash because they like the idea of everybody living in the America they saw in Escape from New York. Yes, most who attacked her were white but they won't be accused of racism. The pattern has been established in America by Democratic Party 'activists:' if what a person says is deemed hateful by the party and media that serve it, this is the excuse to unleash violence on the person. A black homeless woman guarding Donald Trump’s Hollywood [now restored] Walk of Fame star [after it was vandalized by a millionaire 'activist'] was the victim of violent harassment by an anti-Trump crowd. Videos of the abuse show people yelling at the woman and knocking her to the ground as the insults continue. A number of videos titled ‘Crazy 4 Trump’ posted on YouTube show a crowd of people surrounding the woman as she holds up banners in support for the Republican presidential nominee. Her hand-written signs promote pro-Trump messages like “Twenty million illegals and Americans sleep on the streets in tents” and “Donald Trump - keeping it real”. A crowd on Hollywood Boulevard, not a hotspot for Trump supporters, did not share the woman’s political preferences. Nor did they choose to let her be. People are heard yelling insults at the woman, but one man temporarily stops the insults. His words calmed the crowd briefly, but verbal abuses continued as someone started accusing the woman of “spewing” hate. Soon, the situation turned violent, with some physically assaulting the woman and damaging her property. She was knocked off her feet, her cart overturned and her banners torn to pieces. Once she was down, she remained on the sidewalk. Some in the crowd urged others not to touch or help the woman, while others asked if she needed water. The woman had been guarding Trump’s star since millionaire activist James Otis hammered it beyond recognition on Wednesday night. The Chinese suddenly melted away from Scarborough Shoal, and just like that Filipino fishermen were able, after four years, to return to their fishing haunts in the area. It turned out that Duterte's about-face with the American government saved Chinese face, allowing Xi to pull back from Scarborough Shoal. And just like that, the crisis in the South China Sea, which could have led to an American war with China that pulled in several countries, was staved off. The U.S. government somehow provided evidence to the Russians that they'd finally embarked on serious efforts to separate 'moderate' rebel groups in Aleppo from terrorist ones, prompting Putin to order a delay of bombing in East Aleppo. And just like that, an international crisis that was careening toward war between the U.S. and Russia was staved off. In a stunning triumph for justice and the principles on which America was founded, a jury acquitted Ammon Bundy and his co-defendants of all charges, even those supported by hard evidence, after Bundy detailed for the jury the principles that prompted his armed stand against the U.S. federal government. And just like that, the crumbling faith of millions of Americans in their fellow citizens was shored. Through a coincidence, the Federal Bureau of Investigation obtained evidence that prompted them to re-open their investigation into Hillary Clinton's unauthorized use of a private email server while she was Secretary of State. The details of what was a genuine coincidence are such an incredible example of poetic justice as to be eerie. And just like that, the blindfolded woman who holds the scales of justice stepped into American politics. Always remember to tell yourself that you'll give up hope when you're dead. Now I proceed to write that advice on the back of my own hand. "By your Spirit I will rise from the ashes of defeat"
AMN, October 27: An emotional video has appeared of a girl, said to be Assyrian, expressing her thanks to the Iraqi army for ridding ISIS from her village. The cross of Jesus is being lifted once more over many parts of Iraq, where for years Islamic State terrorists left a path of death and destruction. As a military campaign to rid the Mosul area of the Islamic state rages on, videos are surfacing of “the people of the cross” reclaiming their homes by raising makeshift wooden crosses over the churches and towns they were once forced to flee out of fear for their lives. The “people of the cross” was the term for Christians used by Islamic terrorists when they beheaded 21 Egyptian Christians in February 2015. According to many reports, the Islamic State has a special hate for the symbol of the cross, which many say points to the religious motivations of their actions. According to a journalist for Ankawa news agency, within two weeks of seizing Mosul, the Islamic State terrorists threw down all the crosses from domes of churches in the city. They also raided the houses of Christian living in Mosul in order to destroy all the crosses and icons. The breaking of the cross is symbolic of what many Muslims believe will happen at the end times. Muhammad prophesied that when Isa (the Muslim Jesus) returns, he will “fight the people for the cause of Islam. He will break the cross, kill the swine and abolish jizya” and establish the rule of Allah throughout the world. But after years of broken crosses throughout Christian towns near Mosul, Iraq, the symbol of Jesus’ triumph over death is returning. Yesterday, “This is Christian Iraq” Facebook page posted a video of two priests and members of the Iraq military elevating a cross made of two wooden poles and copper wiring on top of Al-Tahira Church in Qaraqosh, Iraq’s largest Christian town. Al-Tahira Church (The Church of the Immaculate Conception) is a Chaldean Catholic Church dating back to the 7th century. In 2014, some sources reported that ISIS terrorists destroyed a Virgin Mary statue outside this Church. Since then, most of the other icons and sacramentals inside the church have been destroyed, the interior of the Church burned, the windows smashed. But now, there is hope again that the 50,000 some Christians who were forced to leave Qaraqosh may return. “I’m very happy now that we are able to return to our church,” Father Amar, one of the priests who erected the new cross, told The Daily Beast. But hope mingles with sorrow at the ruin of so many churches and Christian symbols. “It's very hard for us to see our town like this. Everything is damaged. Do you see that the bell of the church is missing? They destroyed it. Why? I don’t know,” he said. A second video, from France 24, shows the liberation of Bartella, a Christian village close to Mosul. In an emotional and symbolic gesture of their return, they too made a makeshift cross of wooden beams and raised it on top of their church. ISIS has executed 232 people near Mosul and taken tens of thousands of people as human shields, UN says. Witnesses in Mosul told CNN that several hundred ISIS fighters have arrived in the city in the past few days from Raqqa in neighboring Syria. 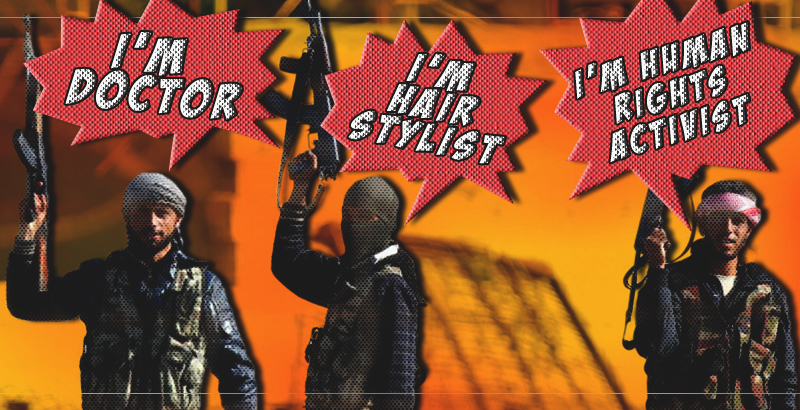 They say most of the new arrivals are foreign fighters who wear distinct uniforms. They are seen wearing suicide belts for show -- and carry light weapons. These fighters appear to have moved to Mosul in small groups to avoid airstrikes, taking a long route to the western Iraqi town of Ba'aj and then across the desert on small roads and tracks. Plenty more bad news in the report, but CNN also reports on great courage, as Mosulians risk instant execution by getting hold of cell phones and calling out to give war reports and 'intelligence' on IS actions inside the city. Oops. In the time I wrote this up, the banner has been removed. Hmmmmm. A call from White House Press Minders, perhaps? A former security officer who fled Mosul in 2015 and current residents say ISIS has built two kinds of tunnels: some to recover the city's rich antiquities and sell them; others to assist the movements of the organization's military network. The fiends are doing their utmost to destroy the country's cultural heritage -- same in Syria, of course. Anywhere they go, it seems. Bundy case: "Even attorneys for the defendants were surprised by the acquittals"
"Maureen Valdez, right, cries and hugs another supporter after hearing the verdict outside federal court in Portland, Oregon on Thursday." I too am surprised by the aquittal, which was across the board -- all Bundy's co-defendents acquitted on all counts. Ammon's faith in the majority of the American people has certainly been vindicated. The story is the stuff of legend. The leader of the armed Oregon standoff sat on the stand for more than three days, laying out his views on the Constitution, the federal government and the duty of man in his plain-spoken way . It was Ammon Bundy’s 10 hours of testimony that likely won over jurors in a trial that concluded with seven people being acquitted Thursday of federal conspiracy and weapons charges, one legal expert said. Jurors exonerated 41-year-old Bundy, his brother Ryan, 43, and five others on charges stemming from their six-week armed occupation of the Malheur National Wildlife refuge in rural Oregon. The Bundys, the sons of anti-government Nevada rancher Cliven Bundy, claimed during the takeover and the trial that they were acting in solidarity with two Oregon ranchers, Dwight and Steven Hammond. The Bundys said they believe the Hammonds were unfairly treated in an arson case. The Bundys also saw their 41-day standoff — which began Jan. 2 — as a protest for their larger grievances against federal control of millions of acres of public lands in the West. "This is much bigger than the Hammonds,” Ammon Bundy told the court about his quest in Oregon to bring awareness to what he called injustices carried out by the federal government. “It’s for my children, grandchildren. Bundy, a father of six, described federal government officials as modern day Roman emperors trying to rule over their subjects by restricting access to resource-rich territories. “We need to wake up,” he told the jurors and the courtroom. "The (UK) Guardian cites terrorist leader to prove there are no terrorists in Aleppo"
Ah! I see from the above that SouthFront is finally developing a sense of humor. This gives me hope the nice young people (I'd guess they're mostly 20-30ish Somethings) who run the site have a chance to remain sane for the duration of the Syrian War. Here, SF describes the Guardian in one of its Full Monte reports. Oddly for an album featuring an American musician that rock music journalists have dubbed one of the greatest rock 'n' roll albums (some went even further in their praise), Jerry Lee Lewis Live at the Star, Hamburg (Germany) didn't become available in the USA until 2014. It was because of a legal issue. And unfortunately the performance wasn't filmed -- or if it was, the film hasn't been released in this country. There are technical criticisms of the album, which was recorded at a club in 1964 under primitive conditions. But Lewis' piano playing is so incredible I think it takes the ear of a professional music critic or sound engineer to notice the record's flaws, at least on the first listen. See Wikipedia's article about the album for details, but one complaint was that the band that accompanied him, the Nashville Teens (actually a British group), was hard to hear. After I listened to the recording it struck me Lewis is a great musician; a visit to Wikipedia indicated that my opinion is in large company. Indeed, Lewis (age 81), the ultimate outsider, might live to hear himself hailed as one of America's greatest pianists. It turns out that Lee was a child musical prodigy. He was mostly self-taught. His parents recognized his talent and mortgaged their farm in Louisiana to buy a piano for him. But his wild-man antics at the piano, coupled with his rowdy lifestyle, tended to distract from the fact that he's a serious pianist and a music pioneer. He created a sound that is to American music what bouillabaisse is to Louisiana. One part rock 'n roll, one part boogie-woogie, one part gospel, one part country, one part jazz, one part blues, and one part indefinable but very distinct. As a musician once observed, every type of music that Lee touches on the keyboard becomes unmistakably his. His mother enrolled him in Southwest Bible Institute, in Waxahachie, Texas, so that he would be exclusively singing evangelical songs. But Lewis daringly played a boogie-woogie rendition of "My God Is Real" at a church assembly. For that, he was expelled the next day. From other remarks in the Wikipedia bio I wonder if he believed the Devil made him do it. At any rate, after he shot to stardom he did agonize over whether his music was leading his youthful audiences to Hell. Later in his career he found himself able to play pure gospel music. But now let's turn the clock back to 1964, to a club in Hamburg that was about to make rock 'n roll history. "King Bhumibol built a powerful role by force of example rather than by force itself"
Not a word did the writer of the following article say about the Communist insurgency in Thailand. It's as if it never happened! To learn about the king's amazing answer to the Communists' attempt to take over Thailand, see this October 19 Pundita essay 1979 BBC documentary on the work of Thailand's king and queen to save a nation. Thailand is mourning its beloved King Bhumibol Adulyadej, who died last week after 70 years on the throne. During his long reign, Thailand shifted from a poor agricultural economy to a prosperous upper-middle-income country. The king’s greatest achievement, though, was to create a unique form of political legitimacy that helped Thailand weather rapid changes in a turbulent region. If the people consider a system legitimate, the country is more likely to remain stable even if the government is ineffective or unpopular. But if large numbers reject the government’s right to rule in principle, disorder or civil war may follow. Modernization creates educated and questioning publics that are able to organize themselves and assert their interests. They ask more insistently why those who govern them are in power. One answer — the modern democratic one — is that legitimate rule is “rule by the people.” We are obliged to obey the government because we ourselves chose it in free and fair elections. Authoritarian governments around the globe have had to respond to this challenge. Many have pretended to be democratic, going through the motions of electionsmanipulated to ensure they remain in power. Others have appealed to the past (by ruling in the name of tradition), to the future (by building an ideal, usually communist, society), or to eternity (by ruling in the name of God). A few charismatic leaders have been able to inspire by virtue of their personal qualities. But all these solutions have limitations. Appeals to the past become less compelling as societies modernize; communism has proved to be a god that failed; God himself is now invoked to justify rule only in parts of the Islamic world; and charisma is a rare commodity that attaches to individuals, not entire systems. Thailand found a unique solution: a revered monarchy that combines several sources of legitimacy — tradition, divinity and charisma — while accommodating rapid economic growth and fitful democratization. These different sources of legitimacy together created a role with enormous moral authority far beyond its formal constitutional powers. The origins were not auspicious. When the young Bhumibol unexpectedly ascended to the throne in tragic circumstances in 1946, the monarchy was at a low ebb. After the abdication of King Prajadhipok in 1935, no king had lived in Thailand for a decade. In the aftermath of World War II, Thailand’s powerful military wanted a usable but merely symbolic monarchy to burnish its rule. But by working tirelessly for the most deprived regions, and by leading a modest and exemplary personal life, the young king gradually built up a deep popular respect and broadly based loyalty that grew into a source of power in its own right. This was much more than usable legitimacy. The king’s words and actions — critical of corruption, committed to the poor — were an implicit rebuke to the greed of military and business elites. The king’s call for a “sufficiency economy” after the 1997 financial crisis, for example, set out a middle way for meeting basic needs through balanced development in response to the manias of hyper-globalization. Most remarkable of all, at crucial moments, this moral force could prevail over the men with guns. The most dramatic example was the king’s intervention in the Black May crisis of 1992. In the midst of violent street confrontations in Bangkok, the king summoned Prime Minister Suchinda Kraprayoon and opposition leader Chamlong Srimuang to admonish them, defusing the crisis and prompting Suchinda’s resignation. No other country has seen such a mixing of the “dignified” and “efficient” parts of its constitution. The “bicycle monarchs” of Western Europe, in contrast, are figureheads who may be admired but wield no power. Where powerful figures do exert informal influence, they are ex-leaders enjoying a political afterlife, as in Singapore. King Bhumibol managed to build a powerful role by force of example rather than by force itself. For political scientists, classifying the Thai political order has long proved difficult — above all because the king’s unique role defies orthodox interpretation. The deeply personal, even enchanted, reverence for the Thai king and his role in the country are alien to Western ways of understanding politics. The ordinary focus on interests and institutions has little place for a charisma of goodness, tradition and semi-divinity that can wield real political power. Paradoxically, King Bhumibol during his long reign presided over the highest rate of constitutional turnover in the world, but in a deeper sense it helped preserve stability. In a region beset by turmoil, Thailand avoided the grim military rule of Burma, the conflict and genocide ofIndochina, and the episodes of extreme bloodshed ofIndonesia. Thailand’s unique form of monarchical legitimacy helped it navigate the dangers of the Cold War and the road to modernity with less upheaval than most of its neighbors. The key question now is how Thailand will sustain and adapt this system of government after the passing of the revered king who built it. Nigel Gould-Davies teaches at Mahidol University International College in Thailand and is an associate fellow of Chatham House. "OK so what are the odds that one of the top five most beautiful women on the planet would also be one of the top five best sax players....boy you really get you some value for money when you go to a Candy Dulfer concert !! !﻿"
That's a comment by one Kevin Fisher, posted 9 months ago at a YouTube recording of a live concert version of the Isley Brothers' For the Love of You done by Candy Dulfer and Angie Stone. I'd heard of R&B singer Angie Stone, who was probably singing gospel music before she could walk. She began playing the drums at the age of five. As a six-year-old she started to play the soprano saxophone. At the age of seven she switched to alto saxophone. ... Dulfer played her first solo on stage with her father's band De Perikels ("The Perils"). At the age of eleven, she made her first recordings for the album I Didn't Ask (1981) by De Perikels. In 1982, when she was twelve years old, she played as a member of Rosa King's Ladies Horn section at the North Sea Jazz Festival. According to Dulfer, King encouraged her to become a band leader herself. In 1984, at the age of fourteen, Dulfer started her own band, Funky Stuff. ... Dulfer is mostly a self-taught musician except for some training in a concert band and a few months of music lessons. However, it's one thing to have been a child prodigy. It's another to take on For the Love of You. No one I'd heard who's tried over the decades has been able to do justice to the original version by the Isleys. Well. Life is full of surprises. "Chaos ensues in Kirkuk as ISIS claims to have captured half the city"
ISIS have claimed to have captured half the city of Kirkuk after entering 5 new neighbourhoods, known as the unofficial capital for Kurds in Iraq. Kurdish police have claimed to have so far killed 6 ISIS militants, who were sleeper cells. ISIS terrorists have also claimed to have stormed an electricity company in the Dibs district in northern Kirkuk, killing all people. Reports have said power is out in Kirkuk. Alalam have reported that of the 16 people killed, 4 were Iranian technicians. ISIS terrorists seized Dar al-Salam hotel in the center of Kirkuk city. ISIS have also claimed to have a hit a convoy of Peshmerga forces in the Dibs District of northern Kirkuk, 25km north of the oil-rich city. Meanwhile in footage captured, the sounds of gunfire and explosions can be heard. Local ground sources have claimed they have seen the Iraqi air force in action, however this could not be verified by Al-Masdar News. Anti-terrorist units have begun operations to normalize the situation in the southern sector of the city, despite images of ISIS terrorists roaming freely. Kirkuk authories have announced a curfew and for all people to remain home whilst anti-terrorist operations are underway. “It was expected that ISIS sleeper cells would make a move one day in Kirkuk now that the Mosul offensive has started and they want to boost their own morale this way,” Kirkuk Governor Najmaldin Karim told Rudaw earlier on Friday. “Some of [the militants] have hidden themselves inside mosques and tall buildings and try to shoot as snipers, but our forces are in control and in places where escalations were feared it was all controlled. Strong forces combined of security, police, and anti-terrorism are all inside Kirkuk today,” he said. “They were sleeper cells...many women and children fled to Kirkuk as refugees and it is possible that some militants had come with them,” Kiruk added, referring to the attackers. The city’s police chief and governor have called on residents to stay in their homes until the situation is under control. The unrest has so far led to the deaths of at least 28 people – six policemen, 12 militants, and 16 power station workers, according to reports from Rudaw and AFP. The workers were killed in the nearby town of Dibis, located 55 kilometers (34 miles) from Kirkuk. However, Kirkuk’s governor reported the station had been attacked by four militants, of whom one blew himself up and three were killed. The station is now under the control of Peshmerga Kurds. Kirkuk is located 174 kilometers (108 miles) from Mosul. The city has accepted some 700,000 displaced people from the country’s central and southern provinces since Islamic State took control of one-third of Iraq in mid-2014, according to Rudaw. It had been home to about half a million people before the outbreak of hostilities. The oil-rich city is claimed by both the Iraqi government and Kurds in the region. Kurdish forces assumed full control of the city in the summer of 2014, as the Iraqi army crumbled before an IS advance. "The sun rises without a king"
Is this the endgame in E. Aleppo? "Islamists beat liberals in Morocco elections"